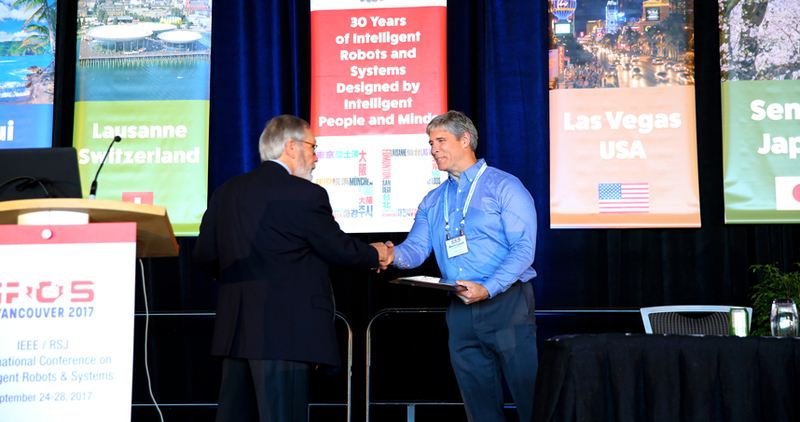 Kevin Lynch accepts the the 2017 IROS Harashima Award for Innovative Technologies. Northwestern Engineering’s Kevin Lynch has received the 2017 IROS Harashima Award for Innovative Technologies, awarded by the IEEE/RSJ International Conference on Intelligent Robots and Systems (IROS). The award, which comes with a $2,000 prize and a plaque, celebrates a member of the IROS community who has pioneered activities in robotics and intelligent systems. Lynch received the award in acknowledgment of his contributions to robotic manipulation. He was formally recognized during the IROS 2017 conference on September 27 in Vancouver, Canada. “IROS is one of our premier robotics conferences, and it's truly an honor to have our work over the past 20 years recognized this way,” said Lynch, professor and chair of the Department of Mechanical Engineering. In addition to robotic manipulation, Lynch’s research interests include motion planning and control for dynamic robotic systems and underactuated systems, assembly and automation, swarm robotics, and human-robot systems. Earlier this year, he released Modern Robotics: Mechanics, Planning, and Control (Cambridge University Press), a textbook that addresses fundamental robotics topics like kinematics, mechanics, motion planning, and control. A freely downloadable preprint version of the book is also available.